The Strangeness of Others Poster. Paul Bowles and Richard Metcalfe as Bill & Charlie. Sarah Hayton & Esther Hudson as Kim & Corinna. Hilary Jane, Steve Kelly & Tommy Dickinson as Katy, Carl & Stuart. Janet Thompson & Tommy Dickinson as Nancy & Stuart. Originally produced by the Royal National Theatre and a winner of the George Devine Award, The Strangeness of Others is an intriguing play about our relationships with, and need for, other people. 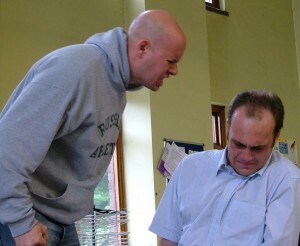 Trust, fear and hope feature heavily in this touching drama, which brings together individuals from all walks of life. From cold damp shop-doorways to warm lavish penthouse apartments, the city can be ‘home’ for everyone. This was a Rocket Showcase Production, performed by members of the adult acting classes. Esther Hudson, George Ogazi, Hilary Jane, Iain Hoskins, Janet Thompson, Melissa Anne Ward, Meredith Hurst, Noel Vernon, Paul Bowles, Paul McGowan, Rachel Fairburn, Richard Metcalfe, Sarah Hayton, Steve Kelly, Tommy Dickinson. 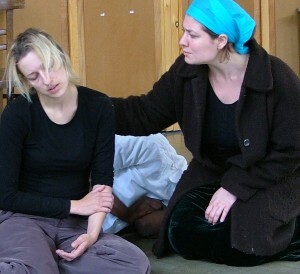 23 – 25 June 2004 / Blue Box Theatre, Chorlton, Manchester.